A diverse day of Marine talks and Forest Wildlife exploration. Lectures include Seabird & Sandeel Research by Sarah Wanless. Sarah’s work is to understand the impact of global change on marine top predators, particularly seabirds. Most of her research is field-based, much of it on the Isle of May. Her current research extends beyond the breeding season and uses traditional and bio-logging approaches to track individuals year round. This work proved essential to the conservation of marine ecosystems and resulted in the ban of sand eel fisheries in the western North Sea. The other lectures feature Maya Plass and Dr Tom Cameron from University of Essex. Come along to Fingringhoe Wick EWT reserve for this annual event with the EBwS and Essex-based Wildlife holiday company ‘Swallow Birding’ for a day with guided bird walks around the nature reserve with expert guides. There will also be help with bird identification, great food and drink in the tearoom during the day and a chance to renew your EBwS subscriptions! Don’t miss out, we hope to see you there for this FREE event. On Saturday 11th August RSPB Rainham Marshes is hosting an event organized by Birders Against Wildlife Crime to mark Hen Harrier Day 2018 – to celebrate hen harriers and publicise their plight. We'd like to invite you to join us for this rally, which will include speakers and activities suitable for all, including for families! Speakers confirmed so far include David Lindo (The Urban Birder) and RSPB Director of Conservation Martin Harper. All money raised goes to Birders Against Wildlife Crime and they'll be giving an update about their raptor satellite tagging project too. We're anticipating a busy day and are urging people to use public transport – the reserve is just a ten minute walk from Purfleet station on the C2C line. Additional car parking is also available in Purfleet at the public car park just west of the train station. The car park will open at 8am, and the main rally with speeches is set to start at 11 am. The speeches will take place in the marquee field near the Marshland Discovery Zone so leave yourself 15 minute or so to wander down. Join us in saying ‘We want our Hen Harriers back’! Watch this space and @HHDayLondon for more updates. Look forward to seeing you there! Essex Birdwatching Society spent an interesting & enjoyable morning with David Wilkinson down at EWT Two Tree Island Nature Reserve. David is a skilled and enthusiastic ringer, today he and his colleagues managed to ring Common Whitethroat, Eurasian Reed Warbler, Eurasian Blackcap and even a Great Spotted Woodpecker. 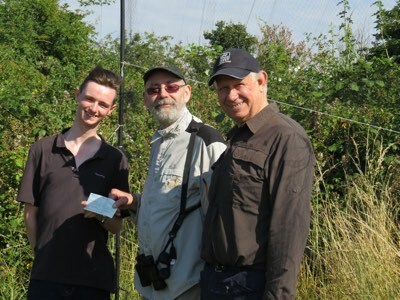 It was an honour for the Essex Birdwatching Society to present a cheque to help with the upkeep of his nets and other equipment. 15:55-16:30 Summing up and ‘Grand Raffle’ draw with so many splendid prizes to be won. The 4th WCWW will take place on the 4th and 5th November 2017. Make a note in your diary to join the fun. To take part it is as easy as A,B,C. A. Go out and see waders/shorebirds wherever you are in the world. B. Send us an email telling us what you have seen and where. C. Look for your birds on the species list and your name on the roll of honour on this website. You will also receive a Wader Quest The Newsletter WCWW e-newsletter special to your email address with all the results, lists and the roll of honour.